Jen made breakfast this morning while Witt completed the repair job. We were on our way by 10am and were in Kasane in time for a late lunch. I enjoyed an enormous hamburger while Jen had spare ribs in the back garden of a pleasant restaurant in town. We spent the afternoon catching up on emails and doing some shopping. We spent the night at Ngima camp, a rather deserted place a few km out of town. Tony and Helen, another couple who came down the west coast of Africa a month after us, joined us at the campground and we spent the evening talking about our experiences. Last day in the desert. 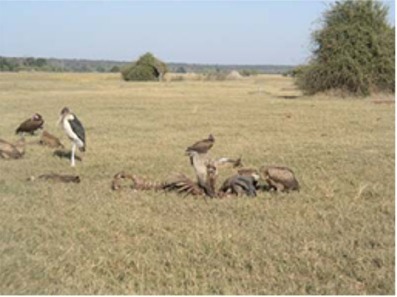 In the morning we made a brief trip around Khutse Pan I and saw jackal, ostrich, secretary birds and giraffe. We then headed out of the park to Gaberone. Just outside the park I put out final 20 litres of diesel into the tank, and by the time we filled up in Molepolole, we had pushed 1300km since fueling in Maun. In Gaberone we had lunch at the mall, then spent some time at the internet café catching up. Plans are afoot for shipping our car back to the States, and those details have to be ironed out. Our original plan had been to stay at Saint Clairs Lions camp where we have stayed before, but we decided to stay at Mokolodi Nature reserve instead, and it was a wise decision. 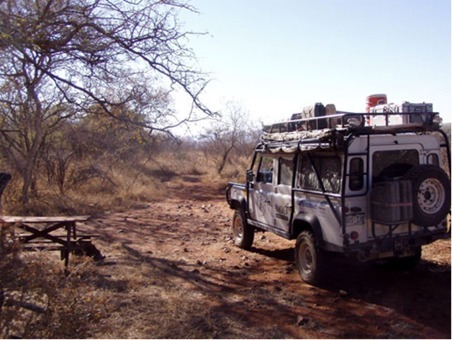 Only 12 km out of Gaberone, Mokolodi offers great game viewing, as well as a lot of educational programs. We had dinner at their fine restaurant and had hot showers in camp after lighting a fire under the donkey. Today is our third wedding anniversary, and we were hoping to be at Victoria Falls to celebrate it, but since the timing didn’t work out we decided to spend an extra day in Chobe rather than traveling. We spent the morning on a game drive through the northern part of the park, seeing hippos, elephant, and a couple of baboons mating. After a nap in the afternoon we went back to town and filled our jerry cans (fuel in Zambia is reported to be expensive) and met our sunset “booze cruise” on the Chobe river. It was very relaxing and very beautiful. We brought beers and snacks and were well prepared to enjoy ourselves. The highlight was approaching very close to a group of elephant and having the sun set behind them. After we backed off, two of the group swam across the river in front of us, their trunks held up out of the water like snorkels. After the cruise we went to the Chobe Safari Lodge, an upscale place on the river, for a great dinner. We even tried grilled mopane worms, a feature of the local diet, but weren’t all that thrilled with them. We spent the rest of the evening talking with Tony and Helen at camp. We did an early game drive in Mokolodi and saw a bunch of warthog. Then crossed the border into South Africa again and made our way down as far as Kimberly. We had some trouble finding the Big Hole Caravan park. The Big Hole is easy enough to find, being the biggest hand dug hole in the world and in the center of town. On finding the caravan park we discovered that the people who run the place had left for the day. We set up camp and then made some phone calls, and while we were on the phone two boys tried to break into our car. Connie saw them by the car and Graham chased them, and luckily they didn’t get anything. We moved the car to the other side of the park, and decided to turn in. Unfortunately one of the other tenants decided to stay up all night playing very loud music. By just after midnight we had had enough, and decided to leave, but that’s the next day! Just before the attempted break in! 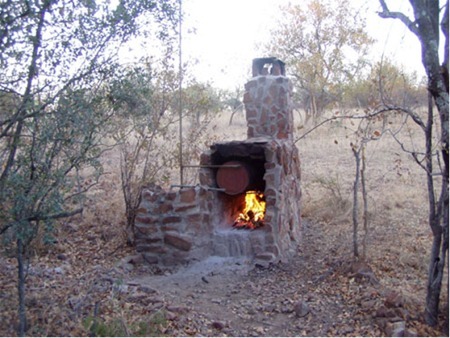 We left the campground at about nine this morning, planning to cross into Zambia and stay a place outside of Livingstone called Kubu Cabins, where we intended to celebrate our anniversary. 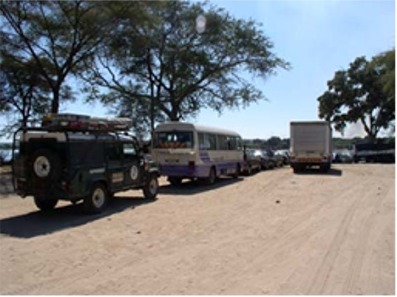 We cleared customs on the Botswana side, then went to the Kazangula ferry, arriving at about 1030. The ferry crosses the Chobe river where Namibia, Botswana, Zambia, and Zimbabwe all meet in the water. Almost as soon as we arrived the ferry stopped running, having broken down, or the crew stopped for lunch or whatever. There was a queue of vehicles and it was after 330 when we finally got on the ferry. We spent the time sitting in the car and reading, or talking with other tourists in line. Getting off the ferry on the other side it was clear we were back in Africa proper. There was much confusion and running around. We located the customs building and bought a 3-year multiple entry visa for $40 each. The Zambian Customs wasn’t interested in our carnet and gave us a temporary vehicle import permit instead, for which there was no charge. We went to a yellow shipping container nearby which served as the office for the state insurance company and purchased the obligatory 3rd party liability insurance for about $6 for a month. When we finally got on the road we passed a long line of trucks waiting to board the ferry. It was clear they would wait for days. 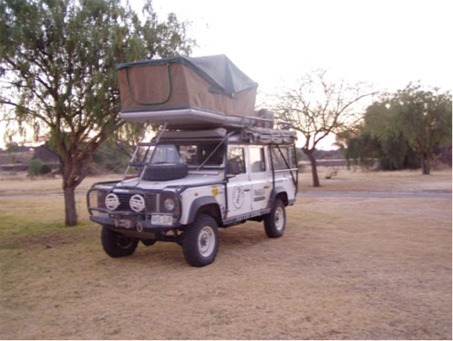 We couldn’t find the entrance to Kubu Cabins, and drove into Livingstone to camp at Zambezi Waterfront instead. The place is a very large complex, including a hotel, campground, restaurant, and tour company. It seems to be popular with overland trucks and there are loads of drunk early-twentys aussies running around. We had dinner at the restaurant overlooking the river and dropped into bed early after a long day. Left the Big Hole caravan park just after midnight, and headed south. At about 5am we stopped by the side of the road for some rest. 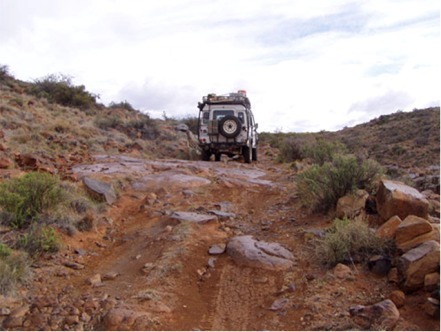 At 7:30am we carried on, and got to the Karoo National Park at about 9:30. We checked in, signed up for the 4x4 trail and then had lunch. 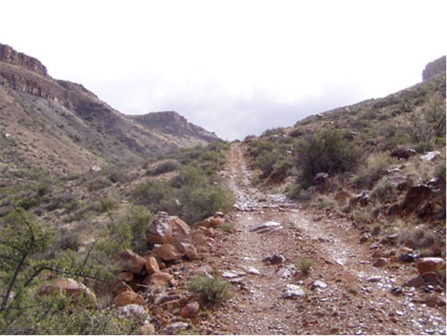 Afterwards, we headed out on the 4x4 trail which climbs up the escarpment. The Karoo is quite barren and harsh, and the main wildlife in the park are dassies whose closest relative is the elephant. We also saw mountain zebra, klipspringers and ostrich. While climbing up the escarpment road, the rear suspension started making some drastic sounds. The sort of sounds that signal imminent failure! One of the rear tires also started loosing pressure. So we headed back to camp and Graham changed the tire. During the change he also discovered that the rear bottom spring mount on one side was tearing itself off the axle. Another flaw with the Safari Gard suspension it seems. The spring mount was cracked most of the way off. Graham decided to keep an eye on it since no welder was close by. It only becomes an issue at full drop on the rear suspension, something that shouldn’t happen on regular tar roads. It may even last until we reach home. After changing the tire we went to dinner at the park restaurant which was very pleasant, and then turned in. Not the best place to discover suspension problems!